www.aicte-cmat.in and http://aicte-gpat.in are the official website of All India Council of Technical Education (AICTE) Common Management Admission Test (CMAT) and Graduate Pharmacy Aptitude Test (GPAT) Examination Application Online, Qualification details, Age, How to Apply etc. Examination will be held on 17th January 2016. CMAT @ 9.30 AM to 12.30 PM and GPAT @ 2.30 PM to 5.30 PM on 17th January 2016. 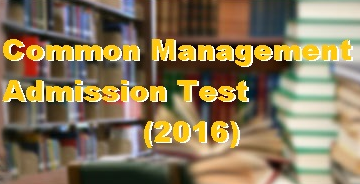 Purpose of Test: Admisions to Post Graduate (PG) Management and Pharmacy Programmes in AICTE approved Institutions, Universities, Constituent and Affiliated Colleges etc. How to Apply Online for CMAT 2016 or GPAT 2016? Interested Eligible candidates have to visit the official website and read and understand the Eligibility and other instruction and apply online on the stipulated date and time. Application Fees Payment can be made through Online and Complete the Online Application Procedure. Admit Card for the Computer Based Test can be downloaded from the Website and Test Venues will be available in the Website.